The USFL was the brainchild of David Dixon, a New Orleans entrepreneur who in the 1960s envisioned football as a possible spring and summer sport. In the early 1980s, Dixon gathered a group of owners from twelve cities and announced the league's launch on May 11, 1982, to begin play in 1983. September 1981: Judge Peter B. Spivak, minority owner of Michigan franchise is appointed interim commissioner of the USFL. May 11, 1982: David Dixon, surrounded by the 12 owners, holds a news conference at the "21" club in New York to herald the birth of the United States Football League. May 24, 1982: The USFL reaches an agreement with ABC and ESPN on television rights. The money for 1983 would be $13 million dollars-$9 million from ABC, and $4 million from ESPN (roughly $1.1 million per team). 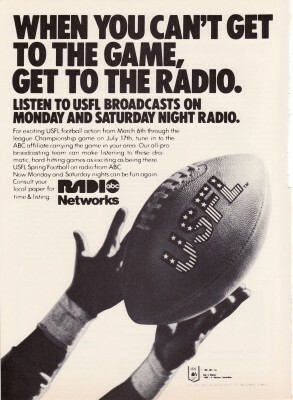 The contract required the USFL to schedule a minimum of three games on Sunday, with ABC guaranteed to broadcast one game nationally or two or more regionally. The contract included no clauses regarding "blackouts" or "cross-feeding". June 13, 1982: Chet Simmons, former President of ESPN is appointed commissioner of the USFL. August 5, 1982: George Allen, coach of the Chicago franchise announces he has signed UCLA All-American tight end Tim Wrightman to a long-term contract. Wrightman is OFFICIALLY the first player to sign with the USFL. Early-August 1982: Bill Daniels and Alan Harmon's request to use San Diego's Jack Murphy Stadium is rejected. The franchise moves north to Los Angeles, thereby forcing Jim Joseph to relocate his franchise to Phoenix. August 6, 1982: Jim Joseph relocates to Phoenix and forms the Arizona Wranglers. August 31, 1982: The owners settle on a $1.8 million dollar salary cap per team, using a 38-plus 2 roster maximum. $1.3 million dollars was allotted to sign 38 players and a 10-player developmental squad. $500,000 was allotted to sign two "star" players that did not count against the cap. This last figure was not "set in stone". Late-September 1982: Chet Simmons officially opens the USFL headquarters at 53 Vanderbilt Avenue in New York. September 20, 1982: The last non-strike game is played in the NFL (NY Giants vs. Green Bay Packers on Monday night at the New Jersey Meadowlands). The strike lasts for eight weeks and results in total losses estimated at $450 million dollars. Steve Ehrhart, USFL Director of Communications, issues a statement that all USFL teams have access to 352 NFL players who would become free agents February 1, 1983. January 4, 1983: The first official USFL draft is held at the Grand Hyatt Hotel in New York City. The Los Angeles Express selected quarterback Dan Marino. 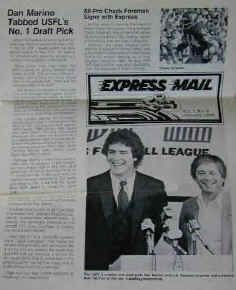 Marino becomes the first player in history to be officially drafted by the USFL. He does not sign. January 7, 1983: Running back Tim Spencer (Ohio State) signs with the Chicago Blitz, thereby becoming the first drafted player to sign with the USFL. February 8, 1983: Herschel Walker signs a contract with the USFL. He is given the choice of choosing the team to sign with. He elects to go with the New Jersey Generals. He signs a three year contract worth $1.2 million per year with a $1 million dollar signing bonus, and ownership in one of J. Walter Duncan's oil wells. March 6, 1983: Opening day of the inaugural season in the USFL. More than 45,000 fans turned out in Arizona and Denver, 42,000-plus in Tampa Bay, 38,000 in Washington, 34,000 in Los Angeles, and 30,000 in Birmingham. The total attendance was around 235,000 an average of 39,170 per game. The national TV ratings for all games played was 14.2, with a 33 share meaning that 14.2 percent of all TV households and 33 percent of all people watching TV at that time had witnessed the birth of David Dixon's "baby." Early 1983: USFL Executive Committee receives 24 expansion applications from various cities in the United States interested in gaining a USFL franchise. The idea was to expand by 4-10 teams for the 1984 season. April 28, 1983: Edward J. DeBartolo Sr. is awarded the Pittsburgh franchise. This caused much aggravation for the NFL as DeBartolo was the father of then (and current) San Francisco 49ers owner, Eddie DeBartolo Jr. The team is named the Maulers in honor of the steelworkers in Pittsburgh. May 11, 1983: Bernard Lerner is awarded the Houston franchise and names it the Gamblers, which causes ABC to object to the name stating "You can't use the name 'Gamblers' for a sports team. There's already enough trouble with gambling in sports!" Never-the-less the USFL had their Gamblers. June 14, 1983: Fred W. Bullard is awarded the Jacksonville franchise and names it the Bulls. July 11, 1983: Clinton Manges is awarded the San Antonio franchise and names it the Gunslingers. July 17, 1983: Logan Young Jr. is awarded the Memphis franchise and names it the Showboats. July 21, 1983: Bill Tatham is awarded a franchise in San Diego, but again the USFL has trouble securing access to Jack Murphy Stadium and relocates the franchise to Oklahoma (Tulsa). They are known as the Outlaws. Early August 1983: Donald Trump purchases the New Jersey Generals. Billy Duvant purchases the Memphis Showboats. October 18, 1983: Trump attends his first owner's meeting in Houston Texas, one month after purchasing the Generals. At this meeting Trump suggests the USFL move to the fall, where the money is and more fans are. January 17, 1984: Trump attends his second owner's meeting and calls for a vote on the move to the fall. The owner's sidestep the vote by appointing a long-range planning committee to study the idea. February 1984: Michael Porter, Harvard Business Professor, delivers a 47-page document entitled "THe USFL vs. The NFL" to 65 members of the NFL Executive Committee. The document details various anti-competitive ways of destroying the USFL. March 1984: Donald Trump meets with NFL Commissioner Pete Rozelle at New York's Pierre Hotel to discuss the possible merger or absorption of one or more USFL teams into the NFL. Early 1984: Doug Spedding purchases the Denver Gold. The Boston Breakers move to New Orleans. Dr. Ted Dietrich, the Chicago owner, and Jim Joseph, owner of the Arizona Wranglers, pull the biggest trade in sports history by swapping all players, coaches and staff. August 22, 1984: Sharon Patrick, an executive with McKinsey and Company Consultants, delivers her findings on the proposed move to the fall. "The league's best hope," she says, "is to continue playing in the spring and move to the fall later on." She also shows the results of a poll taken by several thousand USFL fans. The fans want the USFL to remain n the spring. Discussions on bringing an anti-trust suit against the NFL are held. The USFL holds an official vote on the move to the fall. It passes with the required 2/3 majority. 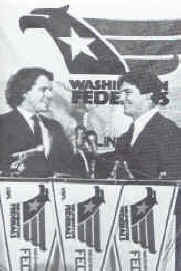 The USFL offcially announces the move to the fall season beginning in 1986. October 17, 1984: The USFL files an anti-trust suit against the NFL, specifically stating that the NFL be limited in dealing with two of the three networks, and award the USFL $1.32 billion dollars in damages. Early 1985: New Orleans moves to Portland. Washington moves to Orlando when Sherwood "Woody" Weiser buys the team. Eddie Einhorn buys the Chicago team. Einhorn decides not to field a team in the USFL's last springtime campaign, so Chicago folds. Michigan merges with Oakland and remain the Invaders. Oklahoma merges with Arizona and becomes the Arizona Outlaws. Late March 1985: Tampa Bay owner John Bassett, suffering from cancer (and whose behavior had been unpredictable for the last several months), launches into a tirade on national television about what is wrong with the USFL. He criticized the move to the fall, called the league its own worst enemy, and said the USFL was guilty of mismanagement. February 1986: The USFL reduces from 14 teams to 8 teams. Houston merges with New Jersey. San Antonio, Oakland, Los Angeles, and Portland fold. May 1986: Federal Court Judge Peter Leisure hears the USFL vs. NFL Anti-Trust case. July 25, 1986: Six-member jury begins deliberations on the case. July 29, 1986: The jury concludes that the NFL is in violation of the Sherman Anti-trust Laws by conspiring to monopolize professional football, and that they did illegally damage the USFL. The jury awarded the USFL $1 dollar in damages (trebled to $3 by law). August 1st, 1986: The USFL owners meet and vote to suspend the 1986 season. They also vote to appeal the jury's decision. Mid-1987: The appeal goes to trial, but the verdict stands. The USFL is awarded $20 million dollars for legal fees. 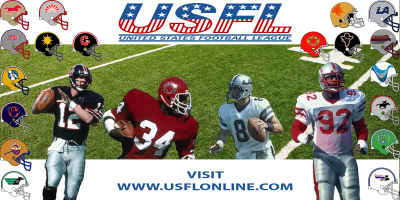 1989: The idea of the USFL as a rival football league officially ends.